Kim and David, who’d travelled from Australia for this UK destination wedding, pulled out all the stops to get the most from this incredible space. They delighted their guests right from the start, as the venue was secret until the last minute. Because we’re obsessed with weddings, it’s a venue we’ve been itching to shoot at for a long time. So naturally when the couple’s wedding planners, the awesome Rocks and Frocks weddings, asked us we jumped at the chance! On chatting with our couple and meeting them on their pre-wedding shoot, we knew they wanted to express their personalities throughout the day, and to make the most of the incredible surroundings. Just as the venue is not like any other country house, they wanted their wedding to be unlike any other. From here we got to know the venue, scoped out the best rooms for couples shots and talked in-depth with our couple about their plans for the day. The day started with the bride’s party and the groom’s party getting ready in the opulent bedrooms of Aynhoe Park. Each room is completely unique, which we love, and it definitely set the tone for a great day. We had a little time before the ceremony so we took each party off for some fun shots around the mansion. On to the ceremony, with our favourite celebrant Katie Matthews – where do we start? Was it the incredible outdoor gardens where it took place? The giant glitter balls that hung from the trees, or the tequila shots handed out by the butler before the vows? These guys well and truly set the scene for the day right here! Guests then gathered inside the Salon for a plush wedding breakfast. How did our couple make their entrance? Dancing to drum and bass of course! Why not? After delicious food we took our couple on a tour of the fabulous house, stopping first in the magnificent library. Cosy, romantic, weird and wonderful it made for wonderful photos, and gave our couples photos a touch of Hollywood glamour too. Despite the tequila shots during the ceremony and the lively wedding breakfast, the reception was when things really, really got started. For the evening festivities The Orangery was transformed into a glittering, neon-lit dancefloor, we felt like we were on a film set! What came next was a fabulous party that went into the small hours; the photos speak for themselves don’t they? 16 hours after we started, and way after the lights went up on the dancefloor and party had hit the wine cellar, Kim and David’s crazy fun wedding at Aynhoe Park came to an end for us. What a day, what a couple, what a venue! Getting married at Aynhoe Park? 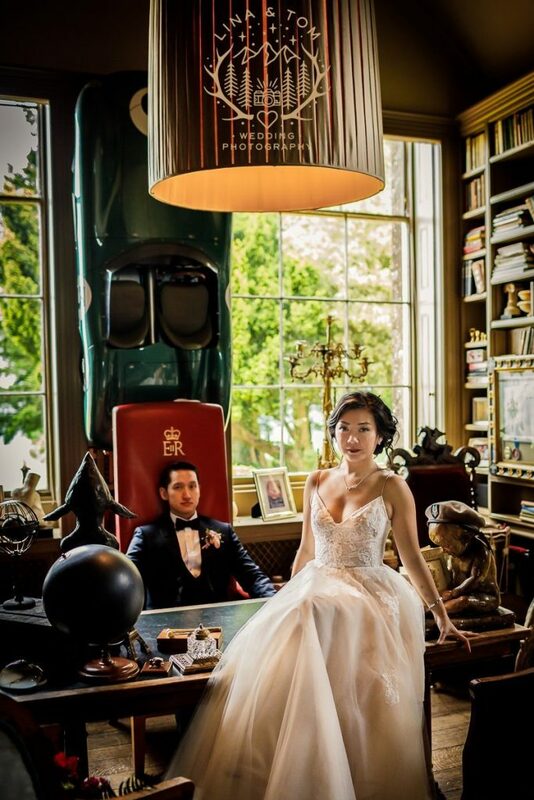 We’d be utterly delighted to be your wedding photographer at Aynhoe Park.